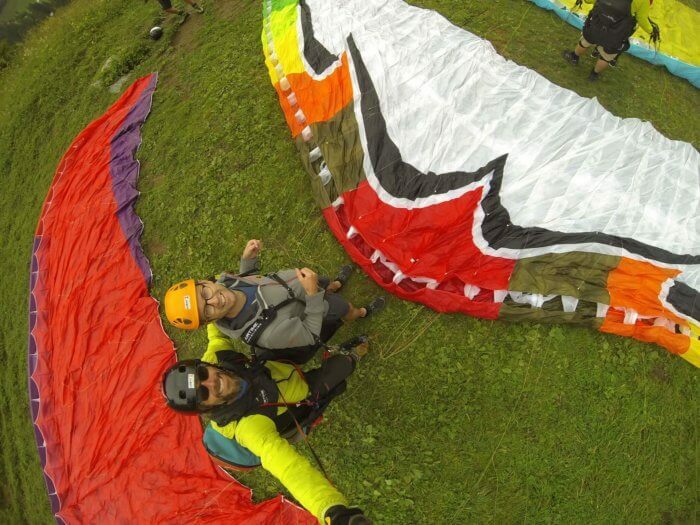 Paragliding in Murren Switzerland - Airtime Paragliding - ramblelove. 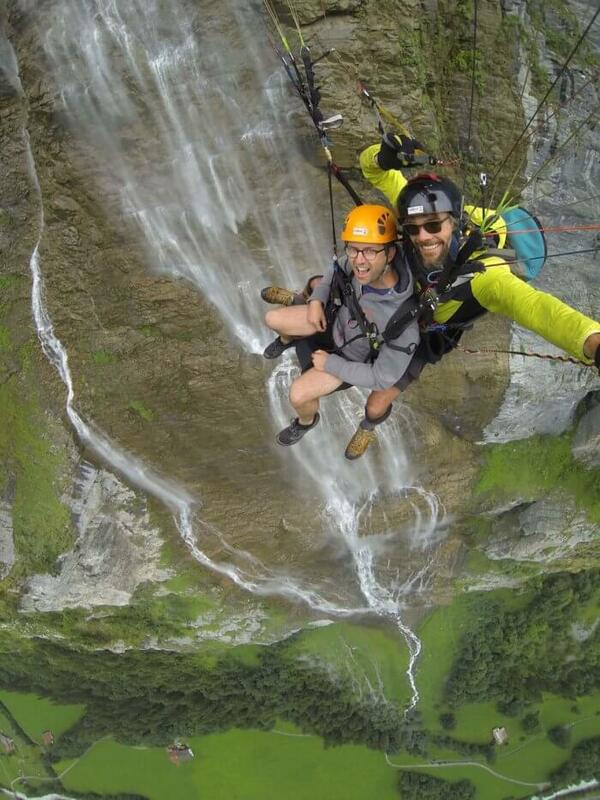 We visited Switzerland a couple years ago and had the time of our lives. I mean, Swiss cows, snow-capped mountains, stunning hikes, and fantastic meals…what more could you want out of a destination? Believe it or not, I did leave Switzerland a little disappointed but that’s only because I neglected to do ONE thing. Jump off the side of a mountain. 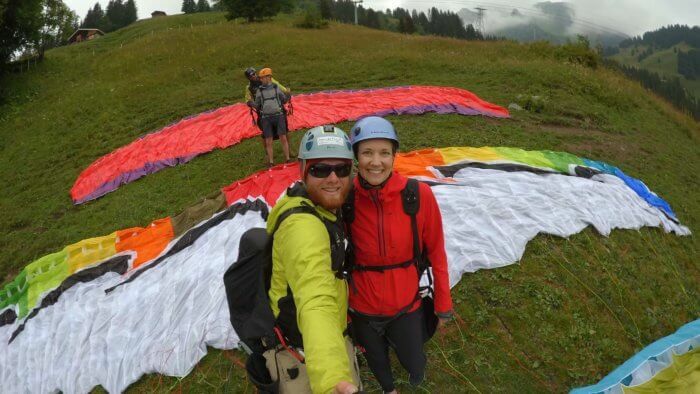 During our last stay, we spent every day admiring the paragliders jumping off the hillside in Murren and slowly weaving their way back down into the valley. Every day we mentioned how it looked like fun and that we should look into. Sadly, we never did. Once we booked our next trip to the area, however, we vowed to make sure it happened. 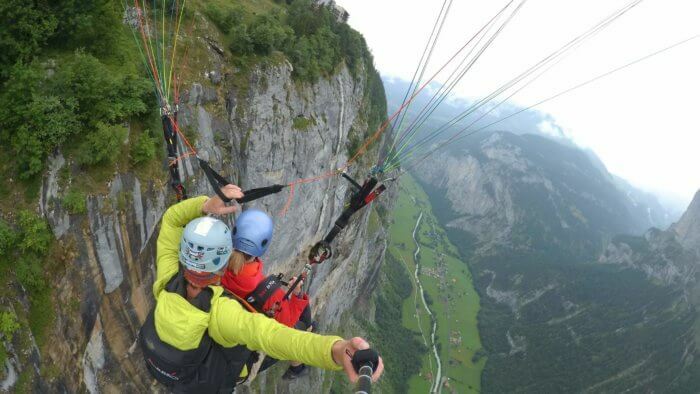 Our second day in Murren, we decided to call Airtime Paragliding to get more information about taking a flight. What I thought was going to be a simple information gathering call turned out to be a let’s get flying call! The person who answered the phone was super friendly and said Tobi could be at the meeting point in 10 minutes so we headed that way. Tobi and the other pilots are extremely friendly and confident, which made the entire experience more enjoyable. I could go on and on about the details of the flight, but pictures and videos probably speak louder than words. See below for a short description of the process and several photos/videos of our flights. I called to book and then we all met our guides outside the cable car station in Murren. 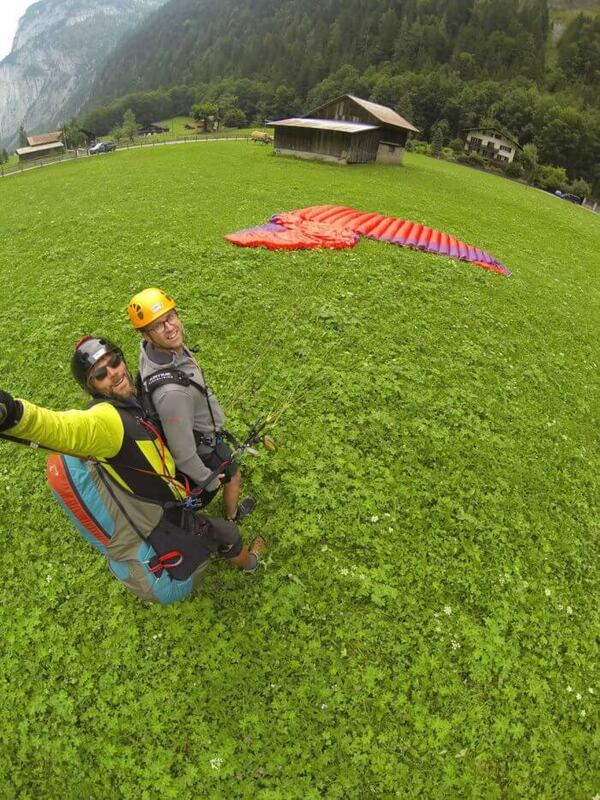 There are signs there for Airtime Paragliding. We hiked roughly half a mile up to the launch point. The guides explained safety rules and basic take off instructions. We JUMPED OFF A MOUNTAIN. We spent +/- 20 minutes weaving back and forth through the valley taking note of the many waterfalls and different points of interest. We also smiled uncontrollably. We landed in the valley and picked up our photos and videos. They can transfer them directly to your smart phone within minutes. 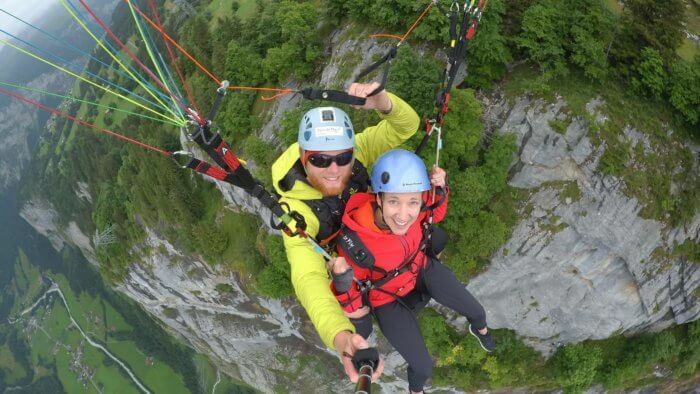 We then spent the next hour or so on an adrenaline high and contemplating doing it again immediately. Music courtesy of my band, She Does Is Magic.